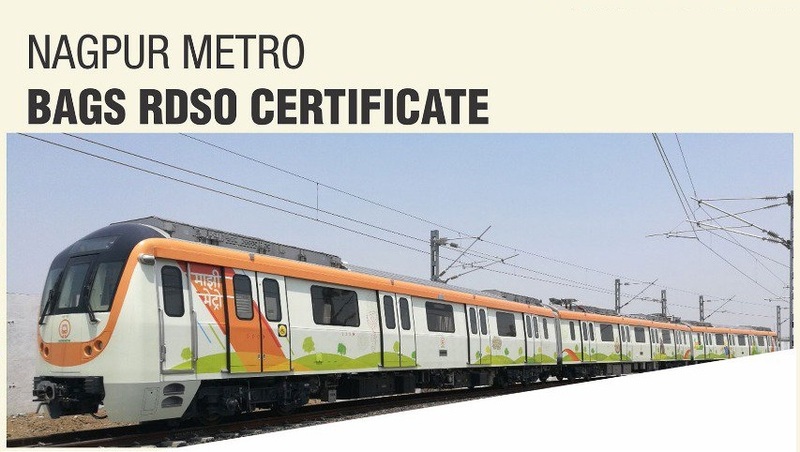 The RDSO certificate was given to Metro, after Oscillation Trials, Maha Metro Nagpur now awaits permission from Commissioner of Metro Rail Safety (CMRS) team, scheduled to visit soon. Nagpur, Metro Rail News: Maha Metro Nagpur cleared a major obstacle, when it bagged the all-important certificate from Research Design and Standards Organization (RDSO). The RDSO certificate was given to Metro, after Oscillation Trials were conducted by the 11-member RDSO team recently. With RDSO certificate under its belt, Maha Metro Nagpur now awaits permission from Commissioner of Metro Rail Safety (CMRS) team, scheduled to visit soon. During its visit and inspection, the 11-member RDSO team had monitored the train movement for some of the major safety parameters including Emergency Brake Distance (EBD) System, Acceleration & Deceleration of Train, Oscillation etc. Sand Bags were kept in the train, as part of the various tests conducted by RDSO. The tests were conducted under dry and weight conditions. Sand Bags weighing 64 tons were kept in the train as part of the Oscillation Trials and all the results of the tests were monitored and recorded by the team. Let us know your thoughts onhttps://t.co/r8UVVzYu7F#NagpurMetro has gone a step ahead towards launching of passenger services soon.